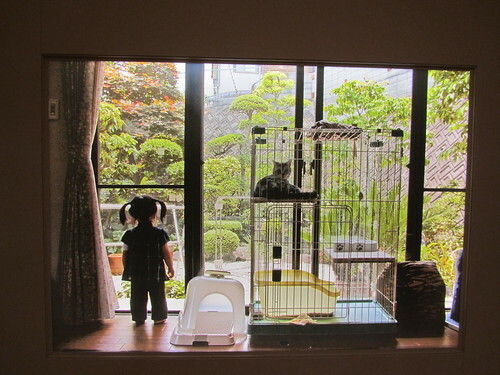 Do you remember the At Home in Japan exhibition I went to at The Geffrye back in July? 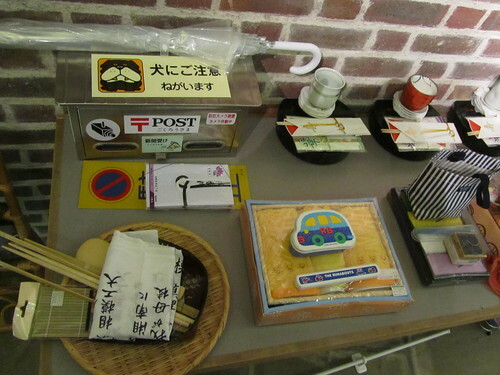 The exhibition is now over, but today they held a special event – a raffle of some of the items from the exhibition. The raffle was a really good idea – and free! Everyone who wanted to participate got a raffle ticket, and then when the numbers were drawn the winners could choose whichever item they wanted, until all of the items had gone. I think everyone got something, as there were a lot of slippers and chopsticks left for the final prizes. I thought the items would be just the cheap stuff – like things from 100 Yen stores – but there were actually a lot of quality items up for grabs (in amongst the cheap stuff). From the moment I spotted it, I had my eye on a karuta set. 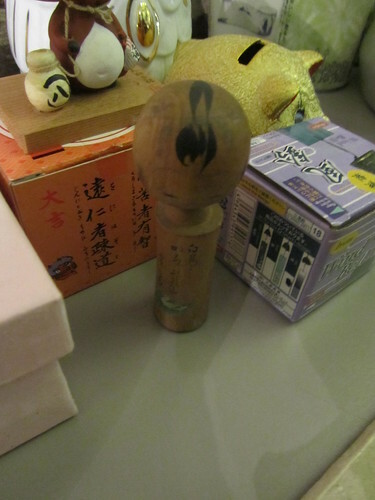 I also fancied a kimono, and this kokeshi doll, but the karuta set was what I really had my fingers crossed for. Interestingly, when I spoke to the curator, Dr. Inge Daniels, she explained that she would take the contact details of people who won items in the raffle in order to contact them in the future. 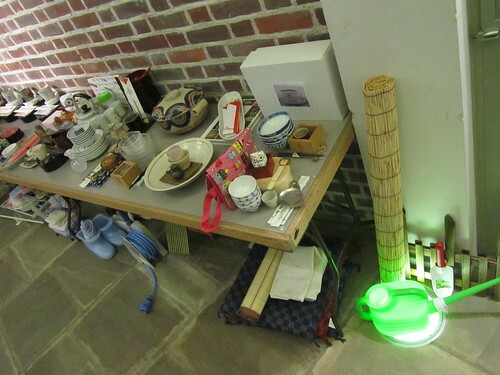 She was interested to know how people would use the items they won, and wanted to maintain a connection between the items’ new owners in the UK and the original owners in Japan. 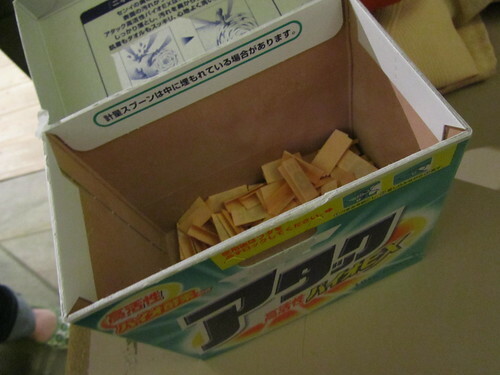 Raffle tickets were drawn from a Japanese washing powder box (a nice touch). It was interesting to see which items people went for. I was surprised when people ignored kimonos and crockery, and went for practical bathroom or kitchen goods, like racks and cloths. I wondered why they chose them and how they intended to use them. I was thrilled when my number came up quite early on. The karuta set was still there and dove straight for it! The basic idea of any karuta game is to be able to quickly determine which card out of an array of cards is required and then to grab the card before it is grabbed by an opponent. There are various types of cards which can be used to play karuta. It is also possible to play this game using two standard decks of playing cards. There are two kinds of cards used in karuta. 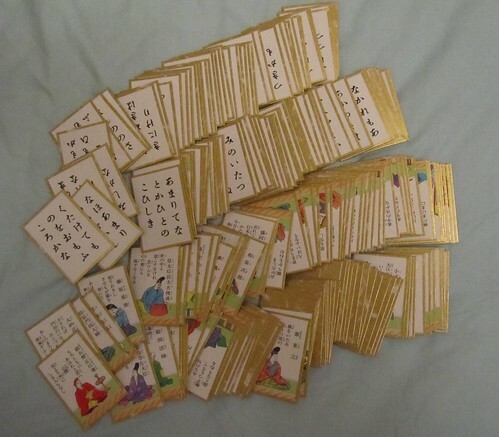 One kind is yomifuda (読札) or “reading cards”, and the other is torifuda (取り札) or “grabbing cards.” As they were denoted, the words in the yomifuda are read and players will have to find its associated torifuda before anybody else does. 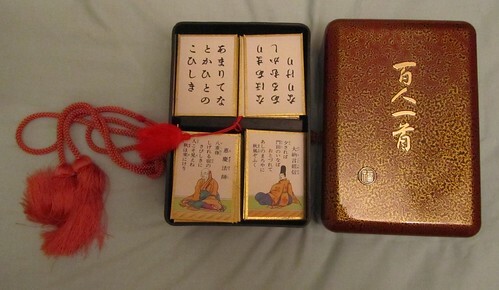 The two types of karuta cards that are most often seen are the “uta-garuta” and “iroha-garuta”. In “uta-garuta”, players try to find the last two lines of a tanka given the first three lines. It is often possible to identify a poem by its first one or two syllables. The poems for this game are taken from the Hyakunin Isshu and are traditionally played on New Year’s Day. Anyone who can read hiragana can play “iroha-garuta” (いろはがるた). In this type, a typical torifuda features a drawing with a kana at one corner of the card. 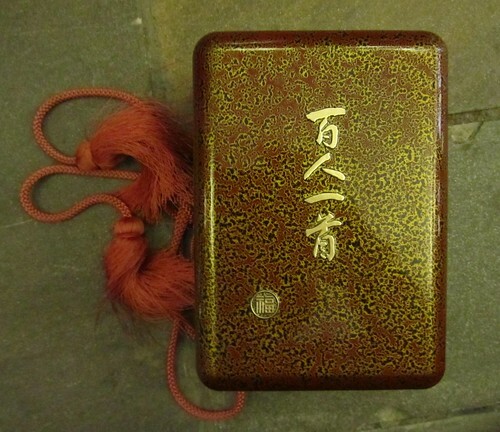 Its corresponding yomifuda features a proverb connected to the picture with the first syllable being the kana displayed on the torifuda. Karuta is often played by children at elementary school and junior high-school level during class, as an educational exercise. Half of the cards in my karuta set have hiragana writing on them, and the other half have pictures with writing. The writing on the cards with pictures also has furigana (small hiragana which help you to read the kanji) so, technically, I can read all of the cards in the set – although I won’t understand them! This set is a kind of uta-garuta using the collection of poems called Hyakunin Isshu (百人一首). In order to play the game, I would need to be able to read all of the cards and understand the words. I would also need to know the poems from Hyakunin Isshu because, to play the game, you need to know which halves of the poems match which halves. At the start of a game, all the 100 torifuda (the ones with the pictures on) are neatly arranged on the floor face-up. When the reader starts reading out a poem on the yomifuda (the ones with just hiragana on), the players quickly search for the torifuda on which the corresponding lower phrase is written. The odds of winning increase if you know the phrases. It could even be possible to take the cards immediately hearing only the first letters of the waka (poem). That’s a beautiful Hyakunin-Isshu set!! My kids have gone to school in Japan since Nursery School (they’re in college now), and are pretty good at the game, especially my daughter. Kids here memorize those verses on the cards, and participate in competitions at their schools every year in January. I love the idea of the Japanese house exhibit, too…it’s quite authentic, isn’t it? Thanks for leaving a comment! Maybe I could learn a thing or two from your kids! 😉 Yes, the exhibition was really well put together and very authentic.